A disease commonly found in fruit tree nurseries and orchards is crown gall. The initial symptoms of a pear tree with crown gall are light colored galls that gradually become dark and harden. As the disease progresses, the tree shows reduced growth. 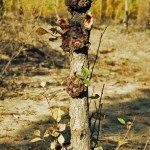 So what causes pear crown gall and is there a treatment for the disease? Let’s learn more. As mentioned, a pear tree with crown gall shows wart-like swellings (galls) on its roots and crown. On occasion, the galls may be seen on the trunks or branches as well. A preponderance of galls actually disrupts the uptake of water and nutrients into the tree from the root system. This causes the tree to look generally unhealthy. What Causes Pear Crown Gall? Crown gall afflicts 140 genera in 60 different families worldwide. It is caused by the bacterium Agrobacterium tumefaciens. The infection passes into the plant through wounds arising from transplanting, wind damage, insect injury, etc. Once the bacterium has entered the tree, it alters normal cells into tumor cells. The extent of damage to an infected plant depends on how many galls are present and how they are situated. Death of the tree may result if the galls girdle the trunk. Also, infected trees are more susceptible to winter injury and drought stress. Control of crown gall on pears is primarily dependent on prevention. The bacterium is systemic and galls can reproduce themselves, so pruning off the swelling isn’t effective. Prior to purchasing the tree, inspect it for crown galls. If a tree becomes infected, dig it and as many of its roots up as possible and destroy them. Take care when moving, transplanting, staking, mowing or cultivating around the tree to avoid injury. Regularly sanitize pruning tools with a disinfectant solution between uses. Also, control insects that feed on roots. Keep the tree as healthy as possible with proper fertilization, watering, and pruning; a healthy, well-cared for tree will go a long way in preventing pear crown gall.